What Is the HGN Test? | Raw Law | Law Offices of Adam M. Thompson, P.C. 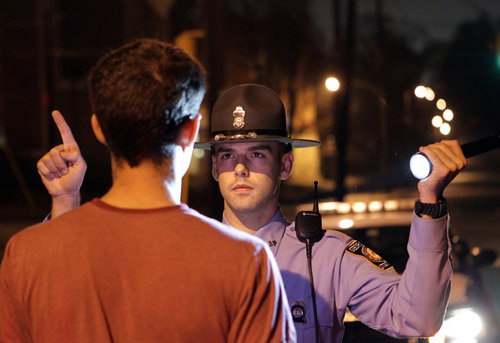 When a law enforcement officer stops a motorist on suspicion of DWI/DUI, driving under the influence, it is common for the officer to ask the motorist to perform a series of field sobriety tests, or FSTs. Typically, the officer will use the three standardized FSTs which include the one-leg stand, the walk and turn and the Horizontal Gaze Nystagmus, or HGN, test. The odds are good that you have seen the HGN test performed on one of the numerous reality television shows; however, you may not understand exactly what the officer is looking for when performing the test. The HGN test is usually performed with a pen light or other similar instrument. The officer will ask the motorist to follow the instrument as the officer moves it from the center of the motorists face to one side and then back again. The subject is told to follow the instrument with his or her eyes only. The officer is looking for "horizontal gaze nystagmus" which refers to a lateral or horizontal jerking when the eye gazes to the side. The way your system is wired, when alcohol or some central nervous system depressants enter your system it become harder and harder to control eye movement, hence the jerking and twitching when your eye tracks to the side. At about a 45 degree angle from your eye your peripheral vision is triggered. If the test subject's eyes show signs of HGN, it is considered to be a sign that the motorist has been drinking and/or is under the influence of a controlled substance. As is the case with the Breathalyzer machine, people often take the accuracy of the HGN test to be a given when, in fact, it is not. There is a certain amount of science that supports the use of the HGN test to test for signs of alcohol and/or drug use; however, that assumes that the test is administered properly and that the results are analyzed correctly. Even if the test is properly administered and the result read correctly, there are a number of reasons why a test subject could show signs of HGN that have nothing to with alcohol or drug use. For this reason, it is imperative that you consult an experienced New York criminal defense attorney immediately if you purportedly failed the HGN test and were subsequently arrested and charged with DWI /DUI, driving under the influence.